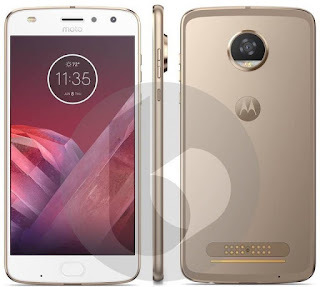 Moto is working on next generation Moto Z smartphones we have already seen press images of Moto Z2 and Moto Z2 Force Now for the first time Moto Z2 Play Press image leaked which shows the design of the smartphone. The fingerprint sensor on Moto Z2 Play looks, similar to the Moto G5 series of phones to offer easy navigation using One button nav feature. It also shows dual-tone LED flash on the front.There is also 16-pin MotoMod connecting port on the bottom part of the back along with a secondary microphone. Moto Z2 Play expected to feature a 5.5-inch 1080p display powered by a 2.2GHz Qualcomm Snapdragon 626 and pack 4GB of RAM.No more details have been leaked yet.